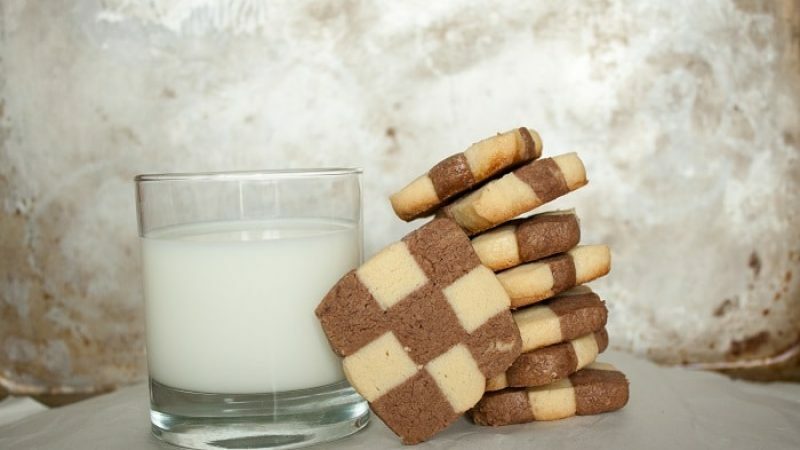 Rodelle’s Chessboard Cookies are sure to shine on your cookie trays, or as a simple treat with coffee or tea. Expect a traditional shortbread flavor with a Rodelle twist! In the bowl of a stand mixer, mix the butter and sugar on low speed with the paddle attachment until smooth. Beat in the egg yolk and Rodelle vanilla extract. Sift in the flour and salt and beat on low speed until thoroughly combined. Divide the dough in half, leaving one of the halves in your mixing bowl. Add the sifted cocoa to the mixing bowl and blend into the dough until well incorporated. Shape each half of the dough into inch long logs. Flatten the sides and top to square off the logs into 2-inch high logs. Make sure the logs are exactly the same size. Wrap each log in plastic wrap and refrigerate for 30-60 minutes. Unwrap the dough and cut each flattened log lengthwise into 3 slices. Cut each slice lengthwise into 3 strips. Brush the strip with the egg white. To stack, alternate strip starting at the bottom, one vanilla, one cocoa, one vanilla. The second layer will be stacked with one cocoa strip on top of the vanilla strip, followed by a vanilla strip, then cocoa. Complete one layer so that you have stacked the trip three high by three wide. Square off with the flat side of a knife or spatula. Repeat for a second log. Wrap logs in plastic wrap and refrigerate for 30-60 minutes. Unwrap the logs and cut into 1/4" slices with a sharp, serrated knife. Place cookies on the prepared sheets, spaced well apart. Bake for 12-15 minutes until firm. Let cool on cookie sheets for 5-10 minutes. Carefully remove to a wire rack with metal spatula. Cool completely. Looking for more delicious cookie recipes? We've got a few! Try our Jam Filled Shortbread Cookies, Cocoa Macaroons, Vanilla and Cocoa Almond Cookies, Vanilla Bean Snickerdoodles, Vanilla Bean Crescent Cookies, and Chocolate Dipped Pecan Sandies! !